A furor erupted this spring on CompuServe after a WordPerfect employee leaked word that because of piracy problems, WordPerfect was abandoning the ST version of its powerful word-processing program. Ron Luks, Chief Sysop of CompuServe's Atari forums, learned from the WordPerfect employee that because WP had discovered their software on at least three pirate bulletin-board systems, the company was pulling out of the ST market. 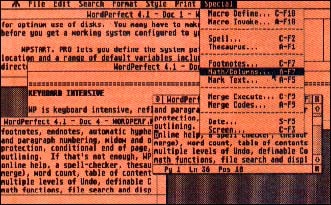 WordPerfect with four open text windows. Luks spread the word on CompuServe, and threats and recriminations flew thick and fast. WordPerfect's Dan Lunt, vice president of marketing, finally went public with an official statement: WP was not pulling out of the ST market, though the company is concerned about piracy. The final result was an online conference on WordPerfect and piracy, which remains a major problem for ST software publishers. Meanwhile, the most recent version of WP at this writing is dated 3/25/88, and it's a big improvement--sort of. Unfortunately, due to a production error at WP, the March 25 update was sent out with a non-updated version of the program. However, the spelling checker was the correct version, and it's a big improvement over the previous version. WP sent out a completely new update--with the correct version of the program--as soon as they discovered the error. WordPerfect for the Atari ST is $395 from WordPerfect Corporation, 288 West Center St., Orem, UT 84057; phone (801) 225-5000. The Hannover Fair in Hannover, West Germany, is big--the biggest computer show in the world, with more than 300,000 attendees. And in Germany, the Atari ST is the best-selling personal computer, so Atari was very well represented at this year's Fair. The Atari booth was 50 feet by 50 feet, and crowded all seven days--you had to elbow your way in through the mixture of families, business people, students and scientists to see what was new with Atari. In addition to the booth, Atari was privately showing several upcoming products. One is the first Atari computer using the Motorola 68030 CPU; the hand-built prototype is specifically designed to run the Unix operating system. There's also a 44-megabyte hard disk for the ST that uses removable cartridges--in other words, each cartridge will hold 44 megabytes. A select few also got a chance to look at Atari's portable ST, which (rumor has it) will be introduced in Europe within a year. Another rumor was of an ST game machine--a stripped-down ST that's designed for playing cartridge-based games using an ordinary TV. Atari was also showing the Abaq--the transputer-based graphics workstation that first appeared last November at the winter Consumer Electronics Show in Las Vegas. Germany: The ST is popular among German engineers; lots of labs use it to connect to real-world input, using A/D and D/A (analog-to-digital and digital-to-analog) converters. Donald Knuth's TeX and Metafont graphics systems, which are popular among scientists for highly specialized mathematical desktop publishing, are also available. There are business programs by the score, including such IBM standards as WordStar and dBase II. The ST version of Borland's Turbo C has just arrived in Germany (and if you'd like to see it in this country, write a letter to Philippe Kahn at Borland International, 4585 Scotts Valley Dr., Scotts Valley, CA 95066, and tell him so). Then there's Adimans--which looks to be the most powerful relational database for any personal computer. It also runs on mainframes and minicomputers from IBM and Hewlett-Packard at prices as high as $18,000, as well as on the IBM PC. It should be in the U.S. soon for the ST, at a price around $200. There are new versions of BASIC in Germany, including a very fast compiled BASIC and one designed especially for writing games. Markt & Technik will be marketing Antic Software's Cyber Family products in Europe, including CAD-3D and Cyber Paint. France: ZZ-Rough is a drawing program that emulates the way a professional paste-up artist works, complete with blue pencil, charcoal and erasers. We also saw a high-resolution video graphics generator with 1,000 by 1,000 pixel resolution, 16 million colors, and built-in genlock for overlaying graphics on an external video signal from a camera or VCR. Benelux: In Belgium, the Netherlands and Luxembourg the ST is also strong. The Netherlands' national railroad just purchased more than 3,000 STs. And one of Amsterdam's biggest recording studios--where the likes of Mick Jagger and Elton John have recorded albums--has junked all its analog synthesizers and replaced them with four STs and new MIDI equipment. England: The transputer-based Abaq should be commercially available soon, and some of the best English-language games for the ST are coming from England's Telecom Soft. There's also some interesting work on robotics--we should be hearing more from England about ST-powered robots very soon. Snapshots: Tom Harker, president of ICD, showing ICD's 100-megabyte ST hard disk; Gordon Monnier of MichTron, looking for new products to bring to the U.S.; Oren Asher of ISD (the VIP Professional people), who are about to bring the high-powered desktop publishing system Calamus to this side of the Atlantic; and START Publisher James Capparell, whose notes on the Hannover Fair made this report possible. In mid-March, Atari sued chipmaker Micron Technology, Inc., claiming that Micron had agreed to sell it 3 million memory chips at $3.75 each, then tried to raise the price. Micron denies having made the deal. Atari has had trouble getting the dynamic random-access memory (DRAM) chips it needs ever since the U.S. government slapped trade restrictions on Japanese and other chip suppliers. The government objected to the Japanese selling so many memory chips in the U.S.; because of foreign competition, only two companies (Micron and Texas Instruments) still manufacture DRAM chips in this country. But since the tariffs and restrictions were imposed, a shortage of DRAMs has developed; Apple and other computer manufacturers have also complained about tight supplies, but Atari is the first to sue a DRAM maker for chip-price gouging. Because Atari builds most of its computers in the Far East, the machines also face hefty tariffs when they're imported into the U.S.--and that means higher prices. As a result, most STs are now being shipped to Europe, where the ST is very popular and the tariff problems don't exist. As a result, many U.S. dealers are experiencing shortages of STs and other Atari products. Atari was hoping to open a new manufacturing plant in the U.S. this spring to sidestep the tariff problems, but the chip shortage has delayed that plant opening indefinitely. Dot Dot Dot. . .
A pirate BBS system in Florida that offered callers 250 illegally copied programs, most of them for the Atari ST, has been shut down. The board took orders by modem, then mailed out illegal copies of the software from MichTron, Origin Systems, Electronic Arts, and other companies. The Software Publishers Association is offering $50 rewards for information that will help shut down pirate BBSs....QuickView Systems' Zoomracks II, the HyperCard-like program for the ST, is now Zoomracks III. New features of the program include better graphics and printing controls; there's now Zoomracks support on GEnie, too. According to Paul Heckel, designer of Zoomracks, the program was recently the key to a deal to sell nearly 10,000 ST systems. Zoomracks III is $295 (upgrading from Zoomracks II is $175) from QuickView Systems, 146 Main St., Suite 404, Los Altos, CA 94022; phone (415) 965-0327....In March, Apple Computer sued Microsoft Corp. and Hewlett-Packard for copyright infringement, claiming that Microsoft's Windows and Hewlett-Packard's New Wave (both programs for the IBM PC) look too much like the Macintosh's display. Longtime ST owners probably remember that when the ST first appeared, Apple threatened to sue Digital Research Inc. (creators of GEM, the ST's mouse-and-menu interface). DRI changed the IBM version of GEM, but Atari refused to change its version. Microsoft and H-P deny they've infringed any of Apple's copyrights, and they'll fight the suit in court. . . 1st Word Plus and the GST C compiler are now distributed in the U.S. by Prospero Software . . .Mail-Pro, the database program from Hi-Tech Advisors that's designed for mailing lists, is now only $39. If you bought the program for $69, you can get a gift certificate for other Hi-Tech Advisors software For more information, call the company at (813) 294-1885. . . Mindscape's Superstar Soccer will be available for the ST in July, but in the meantime the company has sponsored the first-ever U.S. national indoor soccer youth tournament. Eleven teams from Baltimore to San Diego competed for the 1988 Mindscape Cup; the winners were from Chicago. For more on the tournament or Superstar Soccer, call Mindscape at (312) 480-7667. . . Buy two Electronic Arts programs before June 30, 1988, and you can pick a third one for only $3 for shipping and handling. You can get details from EA at 800-245-4525 (in California, 800-562-1112). . . If you've got a hot tip or an interesting product for the ST, we'd like to hear from you. Let us know at News, Notes & Quotes, START, 544 Second Street, San Francisco, CA 94107. Apple's Macintosh; the right screen is the Atari ST.